Hunt - I know he could have made it work on the other one without exact pieces. I didn't want to start a newbie off on the wrong foot by telling him to cheat a little. I didn't think he had easy access to hobby shops so that he could run down and get more pieces or different pieces if he needed. Once he gets some running time, he'll want to change it around and then he can start experimenting. Len - How do you explain the picture that shows 10 curves on each end and 6 straights? Why do they include 20 curves if it only takes 18? I must be doing something wrong in figuring this. I was hoping maybe Bachmann folks would enlighten us. I have no idea what they're doing in the picture. I generated the layout using RR-Track software, and it came out the same way as the many fig-8 layouts I've built. 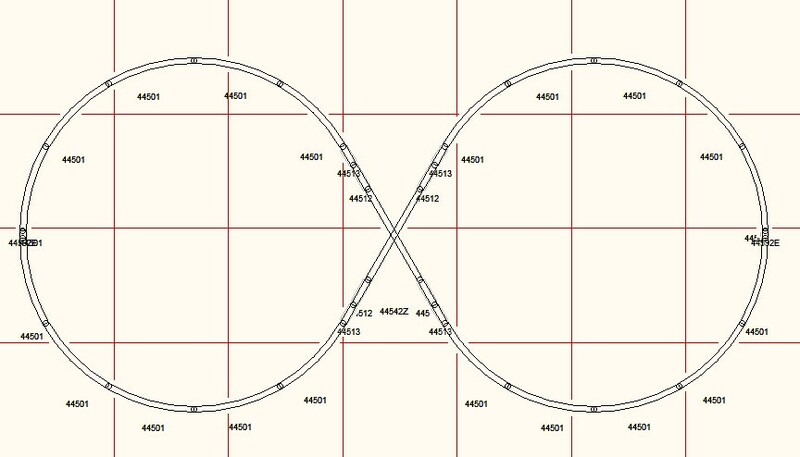 Using 30deg sectional 18" radius curves, it takes 9 curves on each side of the 8 if you're want the tracks to cross at 90deg. It doesn't matter if you're doing an 'Up & Over', or using a 90deg crossing, it takes 18 curves total. It doesn't matter what brand of track is used, as long as the curves are 30deg sections of 18" radius. I just did it in Anyrail and 18 curves and 8 straights comes out right like you showed for a 90 degree crossover. The Bachmann pic isn't showing 90 degree though so I'm still perplexed about that. I'm going to be getting my track out to start setting up for Christmas in a couple of weeks so maybe I'll try to physically lay it out. I don't know if I have 20 18" radius pieces. I gave a bunch of that away. I have mostly 15" now for Christmas stuff. I've had my permanent layout on hold while I work on Dinosaurland and haven't started on it yet but I've got pretty much all the stuff I need now with motive power and track power and pieces. Dug out some old diagrams I did for friends and discovered it does take 20 curves, using 30deg 18" radius, if the crossing is either 30 or 60 degrees. It also takes a bunch of fitter pieces, and even then there's going to be some "adjusting" required. Interesting that you had to add fitters and smaller pieces. The pic Bachmann uses looks like it crosses at 60 degrees. Do you know how long the crossing is? I don't have any dimensions on Bachmann crossings. On the 60, with the fitters, you added 10 1/2" more in straight track - 512 (3") + 513 (2 1/4") X 2. On the ends it look like 592-1 (3/4") +592-2 (1") for 1 3/4". 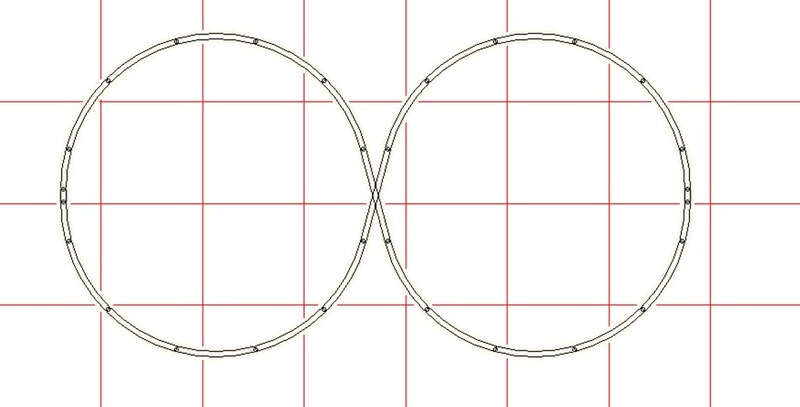 According to the information in Bachmann's catalog, you just need the 22 pieces of curve and the crossing. Is Bachmann fudging it? Just think - Some people sit around and ponder the mysteries of the universe. I can sit around around and ponder the mysteries of EZ Track. Tthe straight sections of the 30deg crossing are 11.25" long, measuring along the center line from one end to the other. The 60deg crossing appears to be an even 11" long. Without the fitter pieces, there definately has to be some "finagling" going on. Hmmm... Joe Satnik said 11 15/16". Your measurement has 11 1/4". I counted the ties on the 30 - 41 ties. A 9" straight has 33 ties. 3" has 10 ties. 2 1/4" has 9 ties. 2" has 8 ties. i was trying to figure it out that way. I found this from Jeff (Jward)back in 2011 regarding Figure 8's. 22 curves for the 30deg crossing makes sense when you factor in the 1/2 curve sections of the EZ-Track version. The difference in the 'fitter' pieces would be due to the difference in the overall size of the EZ-Track crossing vs the smaller Snap-Track version.